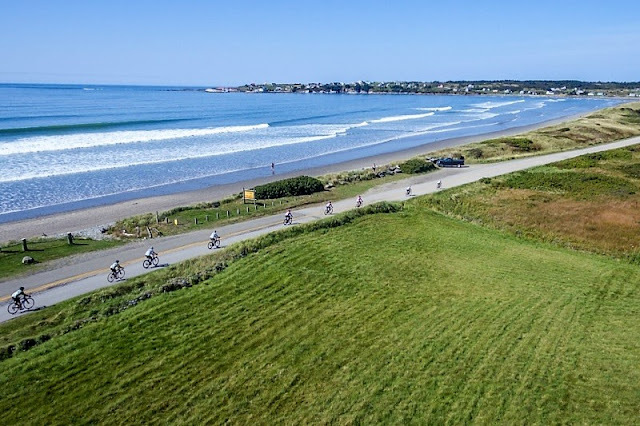 The weather couldn’t have been more different from last year’s as Elva and I stood in front of Vélo Baie Sainte-Marie: 15.5 degrees C and dead calm! What a contrast from 2016 when we shivered at 9 degrees and were nearly blown away! 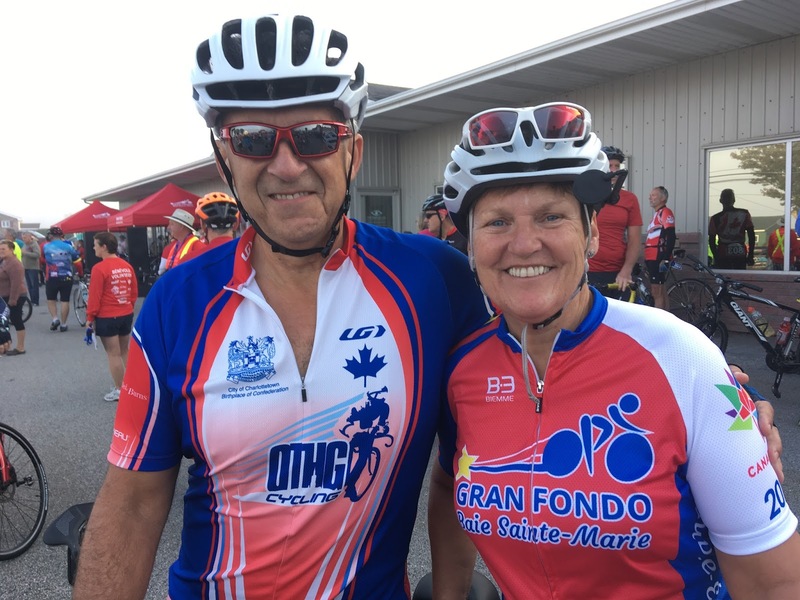 After the wonderful experience we’d had last year, Elva and I registered early for the third annual Gran Fondo Baie-Sainte-Marie. 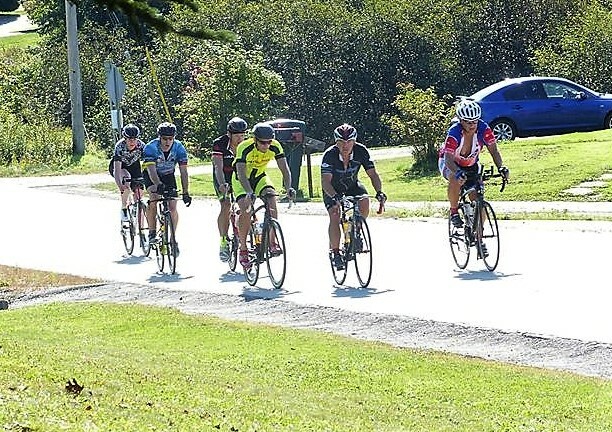 I’d done the Lost Shores Gran Fondo in Guysborough two week before with my Charlottetown riding group, the Over The Hill Gang. Elva opted for the 67 km Medio Fondo and I chose the 117 km Gran Fondo. We branched off Highway 101 at Weymouth, drove through the pretty village along old Route 1, and registered at the majestic old Goodwin Hotel. 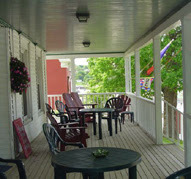 We’d stayed there many years ago during a driving tour around Nova Scotia and had fallen in love with the place. Family-owned hotels like the Goodwin where the owner greets you herself and gives you the lay of the land are a dying breed, unfortunately. We drove along the shore road past the massive granite Église Saint-Bernard that marks the entrance to La Baie Sainte-Marie. We passed through the colourful villages of Anse-des-Belliveau, Grosses-Coques, Pointe-de-l’Église, Petit-Ruisseau, and Comeauville, their houses bedecked with Acadian flags welcoming us to Clare. 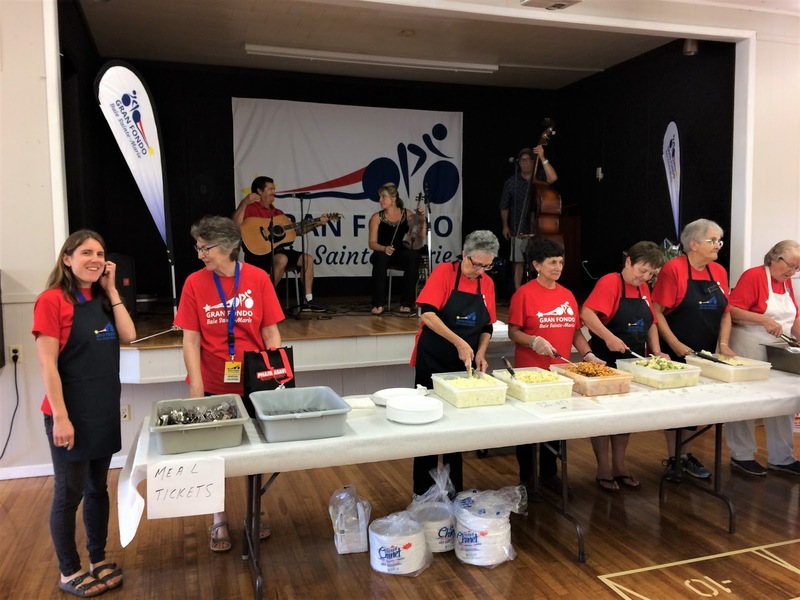 Gran Fondo headquarters in Saulnierville was all abuzz: helpful volunteers everywhere, the familiar smell of chicken fricot, and music. We left there with full bellies and spent a quiet evening at the Goodwin, reading a book on the front veranda in comfortable Muskoka chairs, watching the sun set over the Sissiboo River. Next morning, we got up bright and early, put on our kit and headed down to the dining room. Sure enough, Pat was there to serve us breakfast. She told us the Goodwin has been in her family for 47 years! The meal was delicious. A nice room and meal for two cost us the grand sum of $105! Then, it was our turn to go; a mad scramble as we crossed the start line; a gaggle of riders trying to squeeze through a narrow opening, all at the same time! I felt much safer as we rolled along Route 1. Unlike 2016, there was no treacherous cross wind to deal with and riders seemed much more relaxed. I’d decided to follow Arend and Tabatha and hooked onto their wheels, ready to take my turn on the front when the time came. 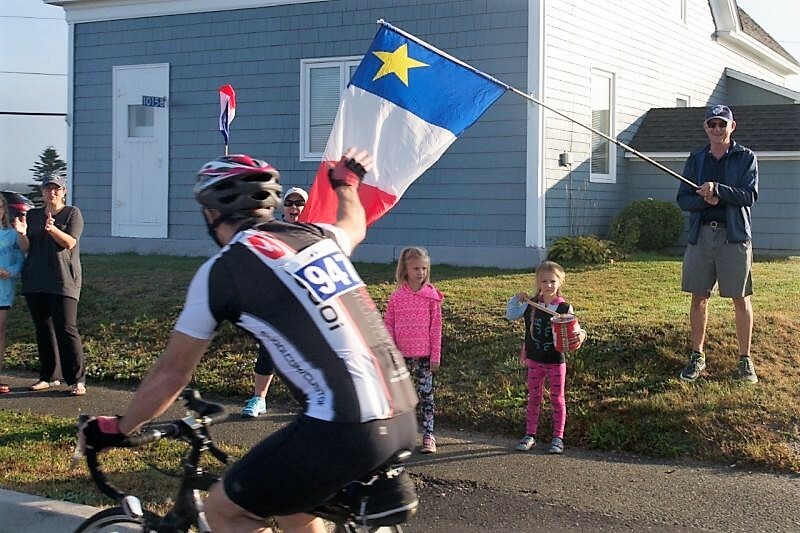 Locals cheered us on, waving Acadian flags and ringing cowbells. Their smiling faces encouraged us and made us feel appreciated. Before we knew it, we’d reached the turnoff just past Saint-Bernard Church and headed inland on Route 340. The fog was starting to lift as we rode through Weaver Settlement, our group down to a half dozen or so with the Islanders doing most of the work on the front. One young rider, a 90-pound teenager, stayed with us for awhile, jumping ahead on every hill. “He’ll be a good one, if he sticks with it”, I thought. Rolling through Havelock, we caught up with a group and stayed with them through New Tusket and Corberrie. The pace line was rather disorganized but I enjoyed the draft while it lasted. A few riders missed the right turn at Corberrie Church but caught up before we got to Concession. I remembered how cold it had been in 2016 when I felt hail going up the first hill on Patrice Road! I was feeling pretty strong as we rejoined Route 1 at the rest station in Meteghan. Tabatha and Arend stopped briefly for water and I stayed with the two remaining members of our group, Dr. Mitchell Stewart and Sean Merritt, as we rode toward Mavillette. But, as we climbed the hill that marks the start of the Mavillette Loop, my legs just gave out. Non-cyclists may not understand this but, on a long ride, your legs don’t give out gradually. They abandon you all at once. One hill, they’re there; the next hill, they’re gone! I watched Mitch and Sean ride off the front, knowing I’d seen the last of them. I turned onto the John Doucette Road and coasted down to the dunes, taking in the beautiful sight of waves crashing onto Cape St. Mary’s Beach. Back on Route 1, I welcomed the slight tailwind although my old legs protested on every hill. In Bear Cove, Arend TeRaa rode up beside me, saying “Those guys dropped you, did they?”. “Like a sack of potatoes”, I replied. Tabatha encouraged me to follow them, so I dug deep. We wheeled into Meteghan and barrelled down the hill past Tim Hortons, so fast I didn’t even get a whiff of a “double-double”. I suffered through Meteghan-Centre and Meteghan River, took one last turn on the front and then watched Arend and Tabatha ride away. I used my last reserves to climb the hill up to Sacré-Coeur Church and coasted the last kilometre or so to the finish line. My odometer read just under 3 hours and 36 minutes. “Not bad”, I thought. I reconnected with the TeRaas, Mitch and Sean, poured a bottle of cold water over myself and took in some much-needed fluids. Elva was there to greet me, having finished her 67 km in a very good time. She’d ridden most of the way alone. 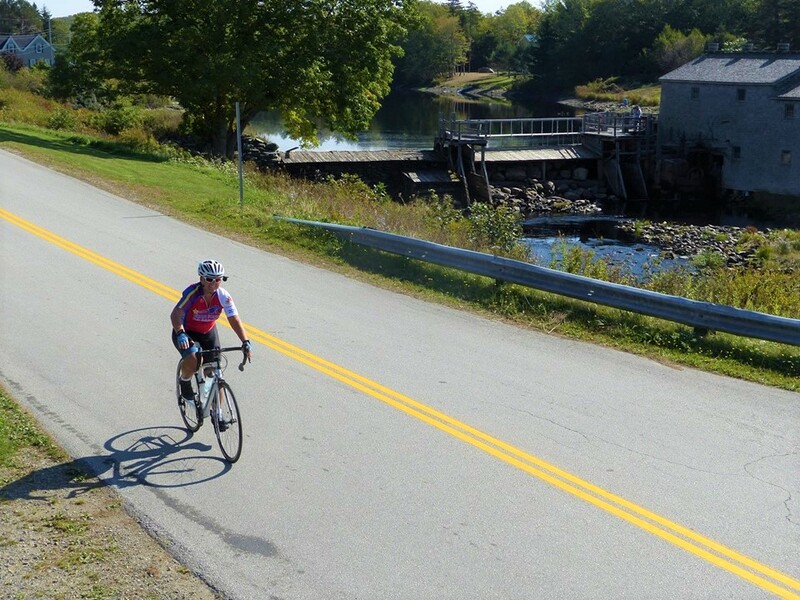 The photos below show her riding past the Bangor Mill and arriving at the finish line behind two other riders. We listened to the live music in front of Vélo Baie Sainte-Marie and I chatted with a few of the volunteers. “How was your ride?” “Where are you from?” “Are you enjoying yourselves here?” The locals were so friendly and seemed so glad to have us visit their community. Acadien pur laine, I may be a bit biased, but the hospitality seemed to come so naturally to les gens de La Baie. 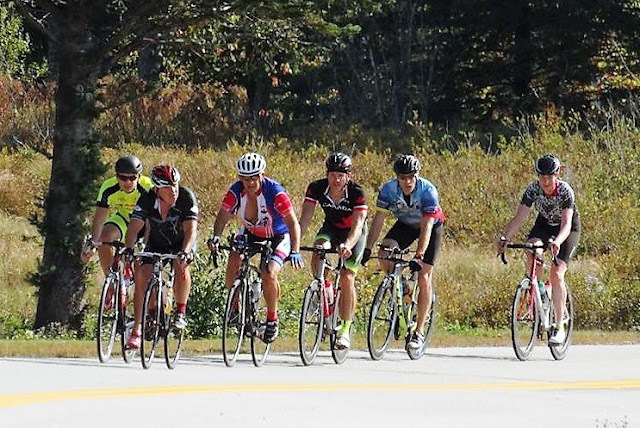 More than a ride, the Gran Fondo Baie-Sainte-Marie is truly a genuine cultural experience. 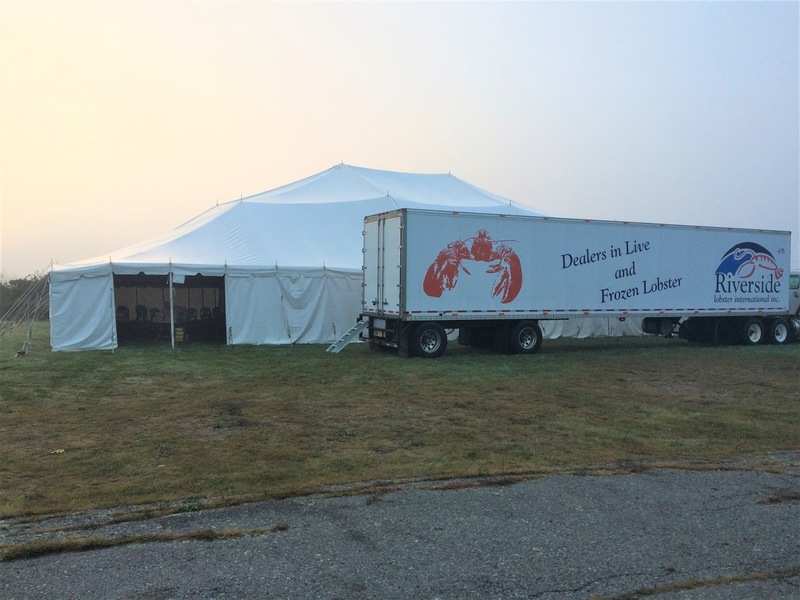 Half-starved, we rushed to the lobster tent. Incredibly, all the beautiful markets lined up on the table before us had been donated by David Deveau of Riverside Lobster International Inc. Nothing like a pound-and-a-quarter lobster with all the fixings to fill a 3,500-calorie sinkhole. And what better way to enjoy such a treat than under a tent, on a folding table, sitting in a plastic chair, digging in with your fingers, juice flying all over the place! Is there a more Atlantic Canadian ritual than that? As I wrote in last year’s blog, I’ve ridden in organized events on Prince Edward Island, in Maine, in New Brunswick and in Nova Scotia, and in six Gran Fondos: three in Québec, one on Prince Edward Island, one in Ontario, and one other in Nova Scotia. The Gran Fondo Baie-Sainte-Marie stands out because of its strong local flavour and the hospitality of the people. It’s in my top two; maybe the best! It’s also a great motivator for those who want to extend their riding season into the fall. 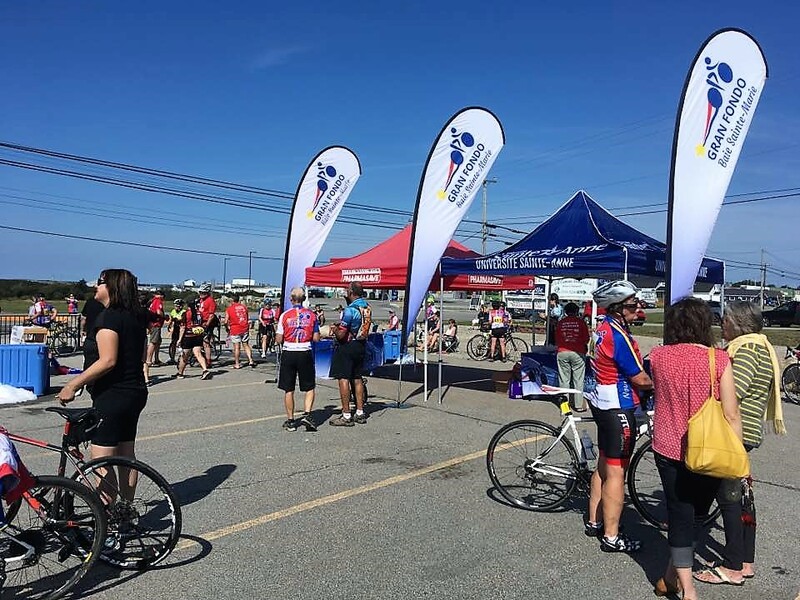 And where else can you get a cycling jersey, a lobster meal, and the experience of a lifetime, all for $100? 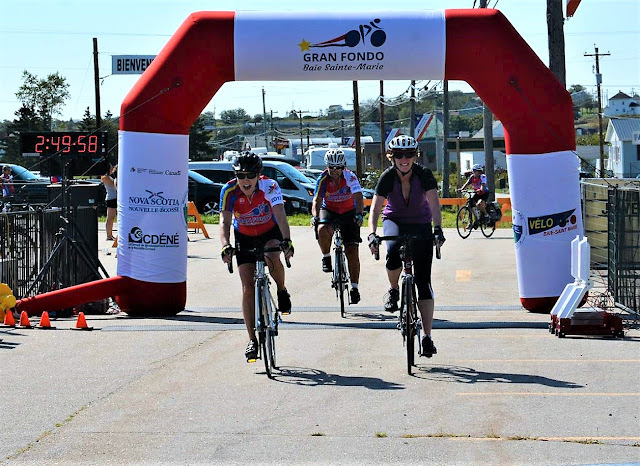 The online results showed that Elva finished 70th of 368 in the Medio Fondo, and 3rd among female riders in her 60-69 age group. I finished 9th of 256 Gran Fondo riders, 1st in the 60-69 age group. Tabatha finished first among female riders in the Gran Fondo, making it three Islanders in the top ten, four if you count Dr. Stewart who will move to Charlottetown soon to set up a family medical practice. 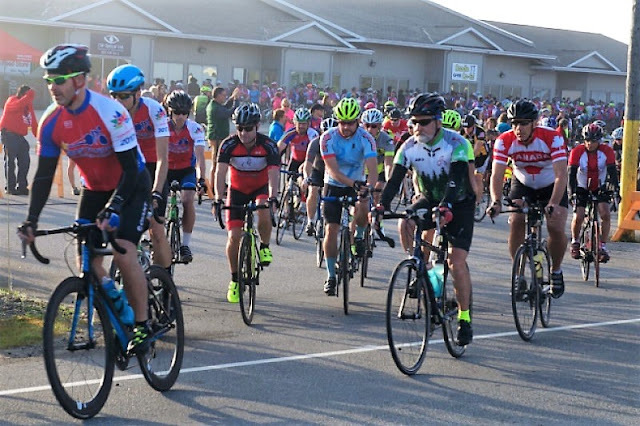 The 917 riders registered for the event ranged in age from 10 to 83. Jim Hoyle of Dartmouth, a spry 83 years young, finished the Medio Fondo in 102nd place, ahead of 266 riders who rode the same distance. Incredible! CHANGEZ POINT RIEN! – DON’T CHANGE A THING!